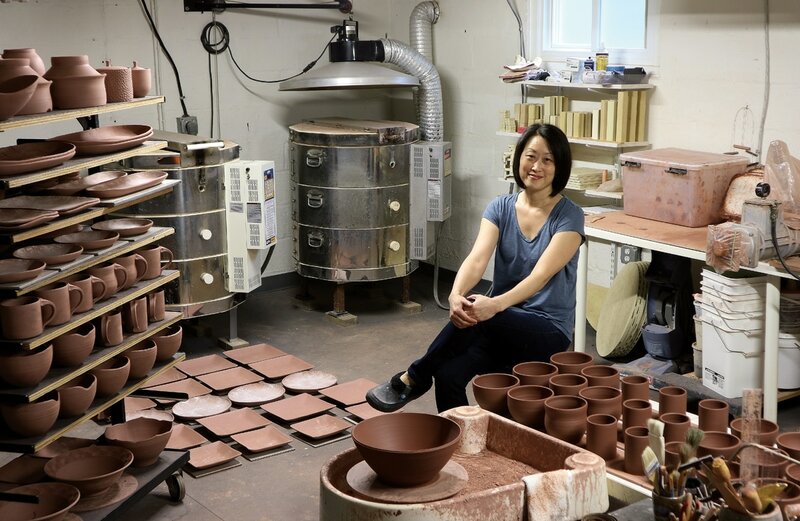 Good Elephant Pottery is handmade by Mea Rhee (mee-uh ree) in Silver Spring, Maryland. "I graduated from the University of Maryland in 1992, with a degree in graphic design. I spent almost twenty years working as a designer, operating my own design studio for most of that time. Don't get me wrong, I enjoyed this career very much, especially the part about being self-employed. But in 1994 I started taking pottery classes at a local community center, and this quickly became my life's obsession. I consider myself "self-taught" because I am not formally trained in ceramics, though I have had many wonderful teachers along the way. I established my own pottery studio, Good Elephant Pottery, in 2002. Since then, my pots have gained a strong following in the Washington DC and Baltimore areas, and is now gaining an audience throughout the Northeast. 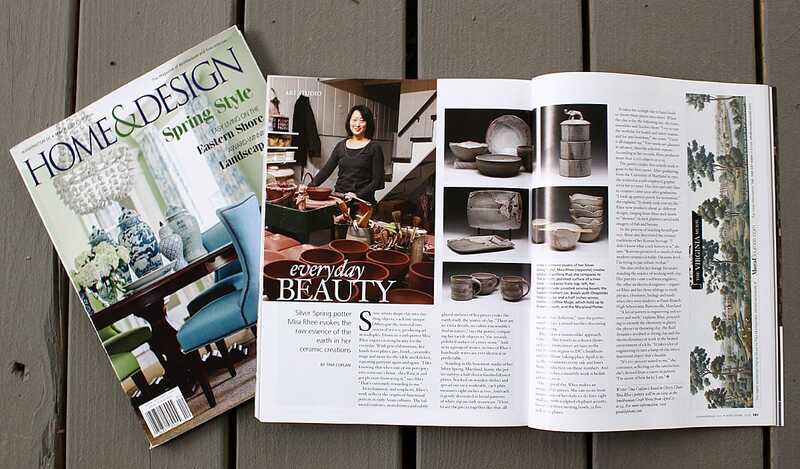 I have been featured in Ceramics Monthly, Pottery Making Illustrated, Home and Design Magazine, and on Home and Garden Television (HGTV). In 2010, I was able to “retire” from design and devote a full-time schedule to the pottery studio. I put “retire” in quotes because I now work harder than ever before. It is a dream come true and I am grateful for this every day." "I am guided by my Korean heritage, Maryland upbringing, and graphic design education. I care deeply about functional designs, always thinking about the balance and movement of my pots in action. My work has a minimal and rustic style, meant to appeal to those who appreciate the natural world, even if they live modern or urban lifestyles. ​Every piece is made by hand, with devotion to the skill and science of pottery, and fired to cone 6 (approx. 2200°F). They are durable enough for daily use, including in the dishwasher, microwave, and oven." 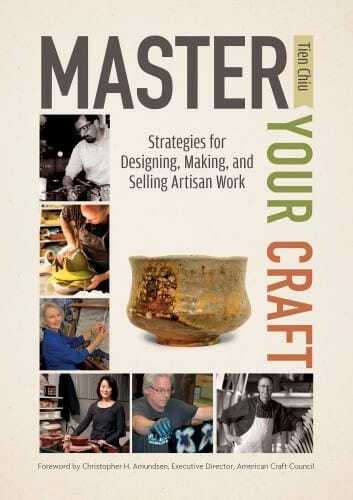 In 2015-2016, I was involved in a book project by the author Tien Chiu, titled Master Your Craft: Strategies for Designing, Making, and Selling Artisan Work. ​​ Look closely at the cover ... that's me in the lower left corner! I was one of 22 craft artists interviewed by Tien for this book. It covers not only how to develop yourself as a craftsperson, but also as a professional craftsperson. A subject close to my heart. The book can be ordered on Amazon, Barnes & Noble, or by visiting Tien's website. I have written about my Ahjoshi Hanbok canister on this blog before. 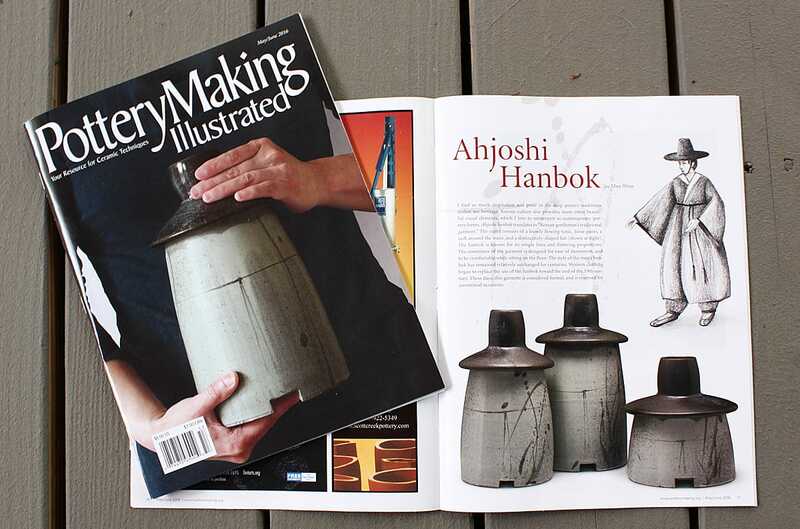 The editors of Pottery Making Illustrated asked me to parlay the project into one of their how-to articles, which I wrote and photographed at the end of 2015. To my delight, they put my pot on the cover of the May/June 2016 issue! Click here to download the entire PDF of the article. 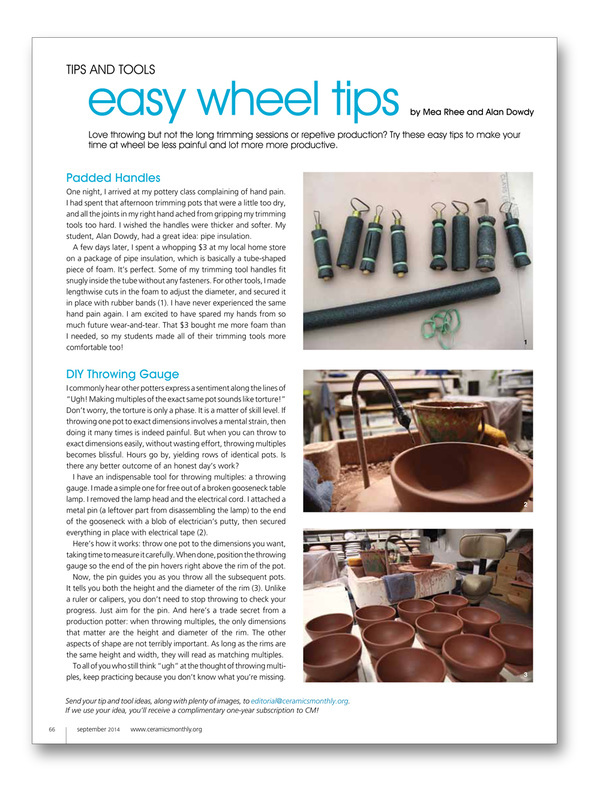 Originally published in Pottery Making Illustrated, May/June, 2016. http://potterymaking.org. Copyright, The American Ceramic Society. Reprinted with permission. In 2017, the Ahjoshi Hanbok article was included in a book! Clay & Cuisine: Techniques for the Studio, Recipes for the Kitchen is a compilation of how-to articles from Pottery Making Illustrated magazine, edited by Holly Goring. Every potter included was asked to contribute a recipe, with photos, that corresponds with their article. In my mind, the canister is a cookie jar, functionally speaking. The cookie recipe can be found on my blog. 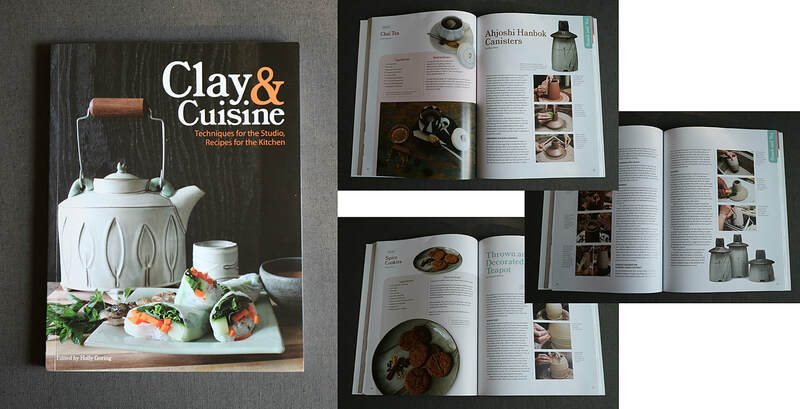 The Clay & Cuisine book is available in the Ceramic Arts Network bookstore. In the Spring of 2016, I was featured in Home and Design, which is a DC-area-based magazine covering home decor and interior design. They like to profile local artists, and author Tina Coplan planned my spread for their March/April 2016 issue so it would lead up to the Smithsonian Craft Show. It worked! At least half a dozen people at the show said they had seen me in Home and Design. 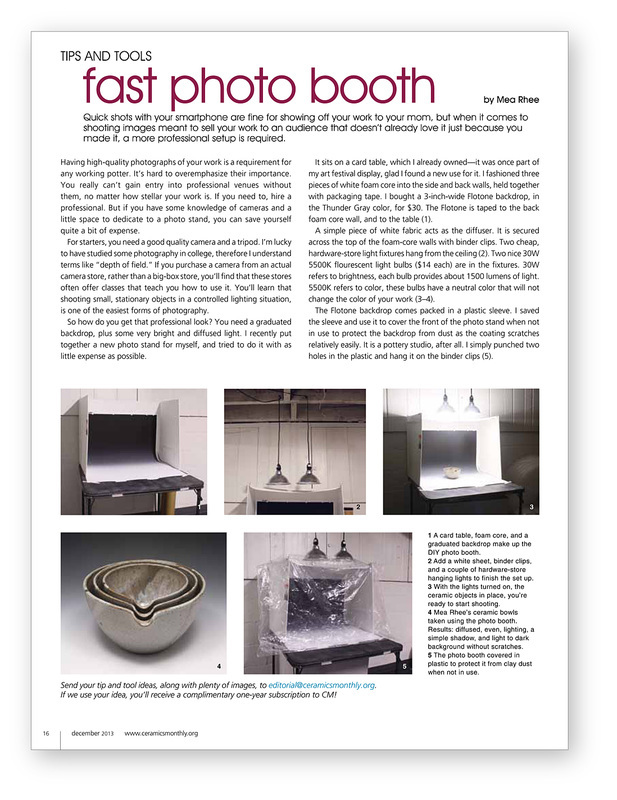 In the summer of 2011, I was featured in Ceramics Monthly. Regular readers of my blog probably found the article to be very familiar. The Hourly Earnings Project was a year-long analysis that I recorded on my blog. The editors of Ceramics Monthly asked me to develop it into an article for them, and it was published in the June/July/August 2011 issue, their annual "Working Potters" issue. You can read the full article at Ceramic Arts Daily online. And you can read all the raw material that went into the project on my blog by clicking on the category The Hourly Earnings Project. 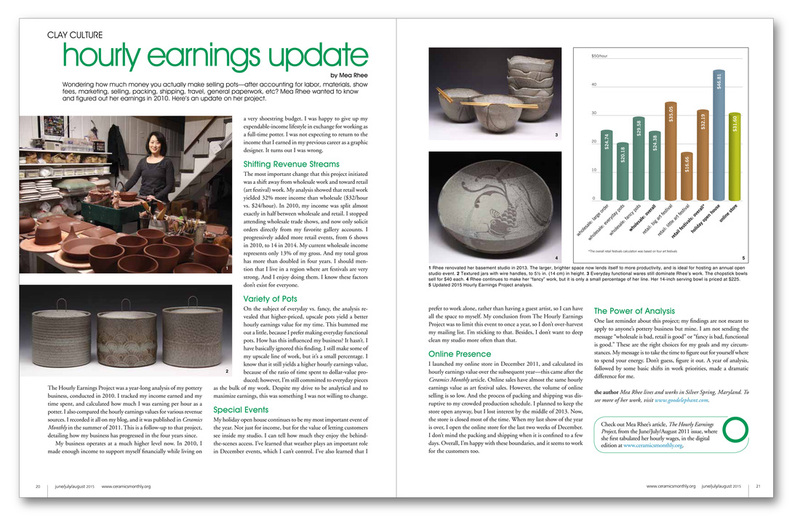 I wrote a follow-up blog post to The Hourly Earnings Project in 2015, and it was also published in Ceramics Monthly, in the June/July/August 2015 issue. 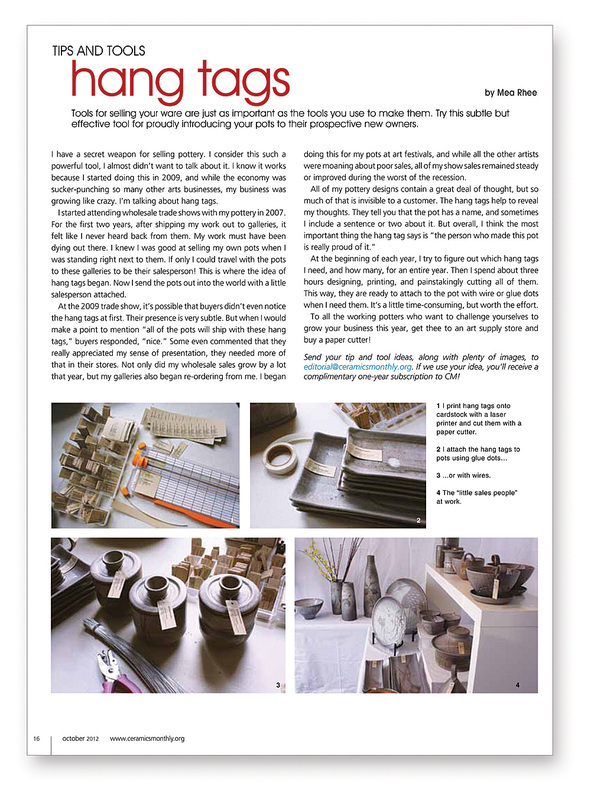 I have also written a few columns for the Tips and Tools section of Ceramics Monthly over the years. Topics have included reclaiming clay, hangtags, a budget-friendly photo stand, padded tool handles, and a homemade throwing gauge.